Please see the Publications tab for an up-to-date list of my papers, theses, etc. ; this page has archived information about some older projects I worked on when I was a student, plus some popular write-ups of work I've been involved with. Published in Nature Communications and Nature Physics; further papers upcoming. Niobium diselenide is a layered material with weak coupling between its hexagonal layers, and so has a quasi-2D structure. It is observed to develop an incommensurate CDW at 33.5K. In fact, it simultaneously develops three CDWs at 120o, in what is termed a 3Q CDW. In dimensions higher than one nesting does not occur generically. Whether it is present in NbSe2 and whether it drives the CDW transition are matters of some debate. An unanswered question is why only one of the two bands comprising the Fermi surface develops a CDW instability. Other mysteries surround the CDW gap offset and particle-hole symmetry, and why the ordering transition is at such a low temperature. Our work consists of a multi-pronged attack under the umbrella of quantum field theory. We argue that the CDW transition is driven by electron-phonon coupling, with nesting playing at most a negligible role. That only one band develops a CDW follows naturally from consideration of the electron-phonon matrix element. By applying the Nambu-Gor’kov formalism we are able to deduce various properties of the CDW gap in the ordered state, and from free energy considerations we have made predictions regarding the stability of 1Q and 3Q CDWs over a range of temperatures and pressures. Higher order Feynman diagrams renormalizing the phonon propagator with internal phonon lines. Considering the higher order Feynman diagrams shown above we take account of the entropy of the phonon field, and show that fluctuations of the field suppress the transition temperature from what would be expected from the random phase approximation. This suppression provides insight into the NbSe2 pseudogap state observed in measurements of the density of states, which is an active area of interest owing to an analogous phase being present in high-TC cuprate superconductors. See references 2, 12, 17 on my publications list. We have several ongoing projects on this topic. This project formed my Master’s dissertation during the PSI programme at the Perimeter Institute. I have maintained an interest in spin ices, and am presently working on an experimental proposal to search for emergent magnetic monopoles in these materials using nanoscale magnetometers. See the publications page for up-to-date information. The report is in two parts, with the second part on Spin Glasses treated below. The first half of the study was focussed on the spin ice systems holmium titanate and dysprosium titanate. These materials have a pyrochlore lattice structure, and the Ho3+/Dy3+ ions are well modelled by Ising spins with nearest neighbour ferromagnetic interactions. The interaction means the spins would like to align, but the lattice geometry disallows all spins to satisfy their minimum energy condition simultaneously – a situation known as geometric frustration. As a result the materials exhibit a macroscopically degenerate ground state, and the best that can be done is to establish a 2-in-2-out configuration for spins on each tetrahedron of the pyrochlore lattice. This condition was already known to give the ground state for another geometrically frustrated system, (normal water) ice Ih, from which the spin ices derive their name. In the image below the pyrochlore crystal structure on which the relevant magnetic ions sit is shown. The colours indicate sublattice sites. On the right is an example of an ice-rule obeying tetrahedron with the arrows indicating spin directions. Pyrochlore lattice (left) and a tetrahedron of spins exhibiting geometric frustration. Spin ices hit the news in around 2009 when it was discovered that they support emergent magnetic monopoles. The minimum energy excitation out of a 2-in-2-out ice-rule obeying tetrahedron is to flip one spin, causing the tetrahedron to become magnetised, and its neighbouring tetrahedron to magnetise the opposite way. With only a nearest neighbour interaction between spins it costs zero energy to transfer the magnetisation through the lattice by flipping further spins, so the ‘monopoles’ are free to diffuse. Including the dipole-dipole interactions of the spins gives the monopoles a Coulomb interaction potential. The image below shows a simple 2D arrangement of bar magnets demonstrating what we mean by emergent magnetic monopoles. 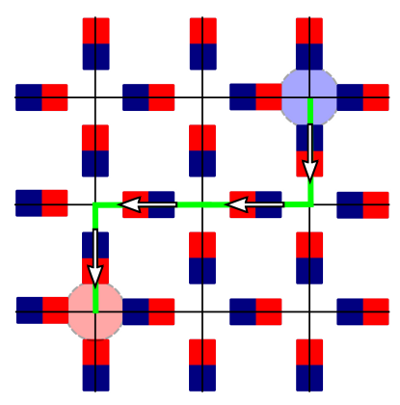 The lowest energy state would have all south poles pointing south or west, for example, with a 2-in-2-out configuration on squares. In the picture two squares violate the rule, showing a net magnetisation. 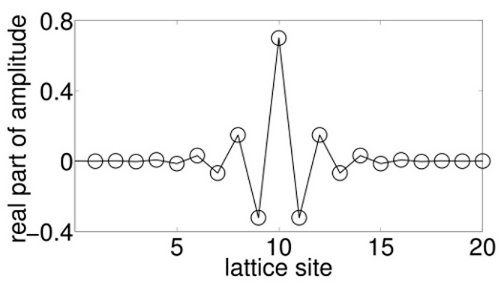 With the rest of the lattice ordered the Dirac string can be seen, but this becomes ambiguous at higher temperatures in analogy to gauge invariance in the quantum case. Bar magnets representing emergent magnetic monopoles connected by a Dirac string. Our study was in how to detect the monopoles experimentally. Although various pieces of evidence exist there is still lacking a ‘smoking gun’. We investigated the temperature dependence of the ‘pinch-points’ in neutron scattering – sharp points in the scattering plots indicating long-range correlations in the lattice as a result of the ice rules being enforced everywhere. To model the scattering we used the large-N method. This consists of expanding the symmetry group of the Ising spins from O(1) to O(N). When N is taken to infinity the model is exactly solvable. We had some success with the method but found that large-N brings with it its own temperature dependence, meaning its application to the study of the pinch-points’ temperature dependence did not provide the evidence we hoped for. Below is shown the spin-spin structure factor (left) and neutron scattering intensity (right) for nearest-neighbour spin ice calculated using the large-N method at zero temperature. The pinch-points are evident. Calculated spin structure factor and neutron scattering pattern for nearest-neighbour spin ice. We are now using the same method for a related project on spin ices, details of which will be placed here in a few weeks. Published in Phys. Rev. B: paper here, arXiv here. The second half of the project came about through serendipitous timing. During our work on spin ices the group of Chris Wiebe was able to grow for the first time single crystals of the spin glass yttrium molybdenate. The material again has the pyrochlore structure, and exhibits geometric frustration. This time the spins are of the Heisenberg type with full O(3) rotational freedom, and negligible dipolar interaction. The name ‘spin glass’ refers to the fact that an ordered ground state for the spins may exist, but the timescale to settle into it is inordinately long – in much the same way as everyday glass avoids adopting a crystalline order. The group found an unexpected ‘ring’ in the neutron scattering profile, suggesting the arrangement of spins of the magnetic Mo4+ ions is somehow liquid-like (liquids having rings in their scattering profiles as standard). We applied our large-N method, out to fourth nearest neighbour interactions, to attempt a reproduction of the ring. We succeeded, but only by ignoring the constraint on the Curie-Weiss temperature, allowing the net magnetisation to be ferromagnetic (where it is experimentally observed to be antiferromagnetic). Enforcing the constraint we carried out a thorough search of the parameter space and demonstrated that the model is incapable of reproducing the experimental results. Below is a reproduction of the experimental neutron scattering plot (left) and our calculated version from large-N theory, neglecting the constraint on the Curie-Weiss temperature. Neutron scattering plots for spin glass. Published in Europhysics Letters; preprint available here. Consider a simple 1D crystal, with atoms equally spaced along a line, and say for simplicity that each atom donates one electron to bonding. We would naturally expect the probability of finding an electron to be peaked at the locations of the ions, forming a ‘wave’ with the same periodicity as the lattice. 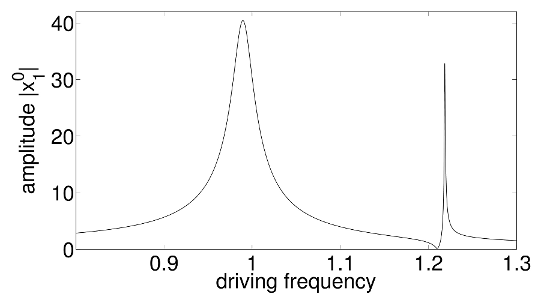 As the charge density is proportional to this probability this is a (trivial) Charge Density Wave (CDW), also known as a charge-ordered state. It was shown as early as 1933, however, that upon cooling the 1D crystal the charge density wave will in fact develop a period of its own, in a mechanism known as the Peierls instability. The period of the charge order may be some multiple of the lattice spacing (a commensurate CDW), or it may disregard the lattice periodicity altogether (an incommensurate CDW). An example of a CDW with double the lattice period is shown below. A period two charge density wave. The instability in 1D comes about because it is always energetically favourable to couple all the states separated by 2kF, the Fermi wavevector. This opens a gap at the Fermi surface which pushes the occupied states down in energy, in a process known as nesting. If asked to name the simplest model in condensed matter physics, most people working in the field would probably state something along the lines of a 1D atomic chain with nearest-neighbour interactions. The simplicity of such a set-up, however, hides a certain complexity in the results. By considering general rational fillings of a 1D band, and plotting the allowed energy states against filling, we produced the image below. Allowed energies against filling fraction for a rationally filled band. See paper for details. At each filling the band has become gapped by the Peierls instability. 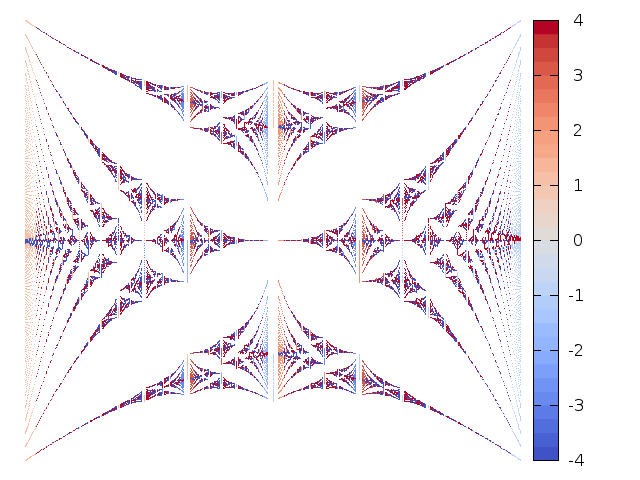 The image bears a striking resemblance to the famous fractal Hofstadter’s butterfly, which originally came up in the context of the quantum Hall effect. That problem provides one of the earliest examples of topology entering condensed matter physics; the colours in the picture indicate the sum of the Berry phases of all sub-bands below the indicated one (truncated for clarity), as a measure of this topology. In fact recent work showed the further equivalence between the quantum Hall effect and 1D quasicrystals, materials which demonstrate a number of bizarre properties, including violating the crystallographic restriction theorem (see bottom of the MPhys projects page). In a mathematical sense quasicrystals can be considered the projection of crystals from a higher dimension. The equivalence of 1D quasicrystals to the 2D quantum Hall effect, however, suggests that the projection might be more than mathematical: 3D quasicrystals we can make in the lab might be projections of 6D objects. The argument hinges on whether a single example of a 1D quasicrystal is able to demonstrate a quantum number demonstrable only by 2D systems. The authors of the work suggest it is. Counterclaims have suggested it is in fact only whole families of ‘locally isomorphic’ quasicrystals which demonstrate such numbers, introducing a second degree of freedom to the problem. We demonstrated the equivalence of all three systems: quasicrystals, the quantum Hall effect, and charge ordering. 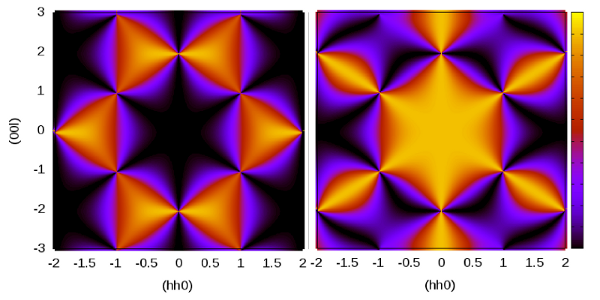 By inspecting the large-scale structure of the Hofstadter butterfly image above we were able to deduce the properties of incommensurately charge-ordered states from the commensurately ordered states appearing in the picture. We found agreement with the counterclaim, that it requires a family of locally isomorphic quasicrystals rather than a single instance to demonstrate a 2D quantum number. In the case of charge ordering, the analogy is this: an incommensurate CDW, in combination with its lattice, forms a quasiperiodic system (the basis of quasicrystals). Moving the charge order along the lattice makes a state equivalent to a different, but locally isomorphic, quasicrystal to the first. By dragging the CDW through a full period you generate the entire family of quasicrystals. You will also find that the dragging has transferred an integer number of electrons across the crystal. This integer number is the ‘2D quantum number’ being searched for – but it is generated by the dragging, necessitating the entire family. This was a project I worked on during my 4th year in Oxford, under the supervision of Mason A. Porter. The project consisted of numerically modelling pre-compressed chains of beads, each of which is a few millimetres in radius. Such chains are known as granular crystals. At low pre-compressions the propagation of sound waves in these media can be highly nonlinear, leading to the existence of interesting wave formations. The most famous of these are solitary waves, which maintain their shape over time through a balancing of nonlinearity and dispersion. (see report for details). The question was whether such modes can exhibit a ‘Fano resonance’, familiar from atomic physics, in which propagating waves incident on the ILM are completely reflected (zero transmission). The effect of Fano resonance is easily modelled by considering a sinusoidally driven simple harmonic oscillator coupled to a second, undriven, oscillator. The characteristic lineshape of the Fano resonance, including a point of zero amplitude, is evident in the amplitude response of the driven oscillator, shown below. Amplitude response demonstrating a Fano resonance. We concluded that Fano resonances are not possible for ILMs in the specific context considered (the lower band gap of a dimer Hertzian lattice – see report) but that this does not rule them out in the upper band gap of the same system, or in different highly nonlinear systems.